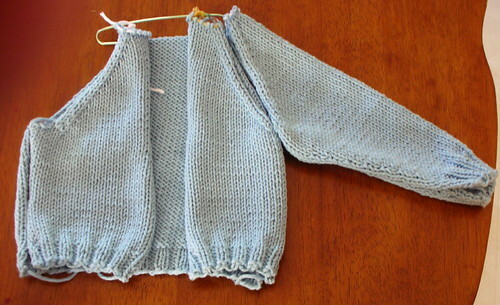 Nicole's Needlework: Baby knitting is great! I love baby knitting... I can't believe I haven't done this before. I've got almost all the regular knitting done on the sweater I started a couple days ago. I just have one sleeve to go! I took a week off from work - my mom was supposed to be moving down to Florida this weekend, and my dh was going to drive her. Well, her closing didn't go as planned and the schedule was already made, so I just decided to take the week off anyway. They're going to try to close on her house next week, and then my brother is going to come up and get her. Having the time off has been nice though... I've gotten a lot of rest, and have been able to keep my house clean! :) DH and I saw The Break Up yesterday. First movie I've seen since Rent was in the theaters. It was ok, the ending was pretty weak. I think the problems she faced are faced by 90% of women out there and we just deal with it. Anyway, I plan to work on my Game Board Sampler today. I'd love to get at least a house and motif done. Write more later! Hi Nicole: It is awesome!! Good job. I need to learn how to knit (one day). I've tried many many times + failed. Our son, Nicholas, learned how to knit at school. He made beautiful scarves! Guess it is all in the color of yarn, size of needles & stitching tension.